Eternal Moon Power Make Up! All Magical Girls have a reason for fighting...I am a Pretty Soldier for Love and Justice...I fight to preserve love, justice, and good in the Universe as I know it (and sometimes, as I don't!). Magical Girls fight annonymously, thus we need an alias to fight under. Mine is of course Eternal Sailor Chibimoon (formerly Sailor Chibimoon and Super Sailor Chibimoon). When fighting Evil it is good to be recognizable as your Super Heroine persona...thus the uniform is essential. As a Sailor Senshi, I fight in a modified Sailor Fuku. It is imperative that we Magical Girls have a quick way to transform from our everyday existance into our Magical counterparts...thus, the Transformation - a Magical Sequence that transforms (in my case) ordinary Chibiusa (who are you calling ordinary?) into Eternal Sailor Chibimoon (!). 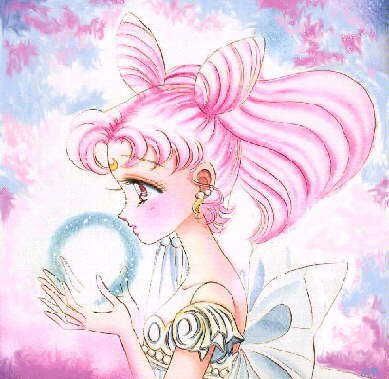 "I am a soldier for Love and Justice - Pretty Soldier Eternal Sailor Chibimoon! On behalf of the Moon, I will punish you!"